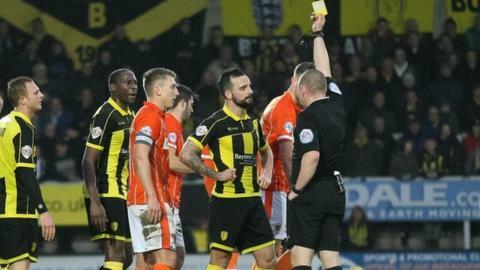 Burton Albion beat Blackpool to return to the top of League One, despite having midfielder Robbie Weir sent-off before half-time. Weir picked up two cautions in two minutes late in the first half. Both sides had threatened earlier, Bright Osayi-Samuel denied by Burton keeper Jon McLaughlin and Stuart Beavon testing Colin Doyle at the other end. Despite being a man down, Burton pressed for a winner, with Mark Duffy curling home from 15 yards. "We said to them at half-time "don't change anything" because after the first 10 minutes we were dominating the game, without that cutting edge. "At half-time we said we'd put Mark Duffy back into centre midfield, get him on the ball, get the ball to Nasser (el Khayati) as well, get it into (Stuart) Beavon's feet and keep going forward. That's what we did." "We could have made defensive substitutions but we didn't want to send that message out. We wanted to go out and attack." Match ends, Burton Albion 1, Blackpool 0. Second Half ends, Burton Albion 1, Blackpool 0. Attempt saved. Tom Naylor (Burton Albion) right footed shot from outside the box is saved in the bottom right corner. Attempt missed. Andy Little (Blackpool) header from the centre of the box is too high. Substitution, Burton Albion. Anthony O'Connor replaces Abdenasser El Khayati. Attempt blocked. Jim McAlister (Blackpool) left footed shot from outside the box is blocked. Attempt saved. Jim McAlister (Blackpool) right footed shot from the left side of the box is saved in the bottom right corner. Attempt blocked. David Norris (Blackpool) right footed shot from the centre of the box is blocked. Attempt saved. Lucas Akins (Burton Albion) right footed shot from the centre of the box is saved in the top right corner. Attempt saved. Jarrett Rivers (Blackpool) left footed shot from outside the box is saved in the bottom left corner. Corner, Burton Albion. Conceded by Tom Aldred. Abdenasser El Khayati (Burton Albion) wins a free kick in the defensive half. Attempt saved. Brad Potts (Blackpool) header from the centre of the box is saved in the centre of the goal. Corner, Blackpool. Conceded by Shane Cansdell-Sherriff. Attempt missed. Mark Duffy (Burton Albion) left footed shot from outside the box is close, but misses to the right. Attempt blocked. Stuart Beavon (Burton Albion) right footed shot from the right side of the box is blocked. Attempt missed. John Mousinho (Burton Albion) right footed shot from the centre of the box is close, but misses to the right. Substitution, Blackpool. Emmerson Boyce replaces Clark Robertson because of an injury. Goal! Burton Albion 1, Blackpool 0. Mark Duffy (Burton Albion) right footed shot from the centre of the box to the top right corner. Assisted by Stuart Beavon. Tom Aldred (Blackpool) is shown the yellow card for a bad foul. Corner, Burton Albion. Conceded by Bright Samuel. Substitution, Blackpool. David Norris replaces Will Aimson.